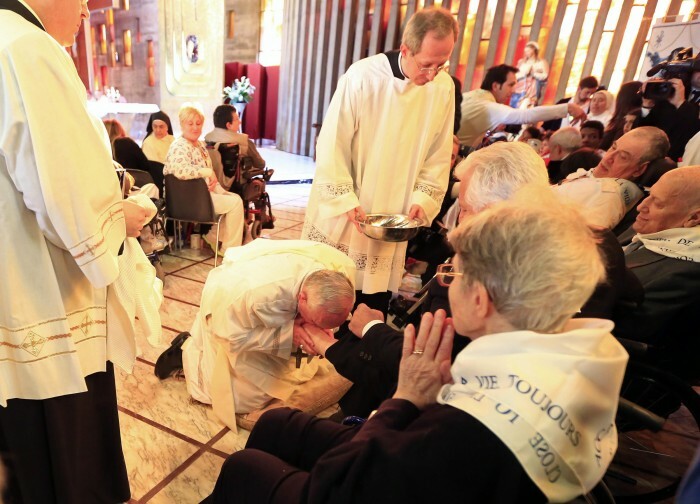 VATICAN CITY (CNS) — In the humble act of washing his disciples’ feet, Jesus is showing all Christians how he wants them to serve others with love, Pope Francis said. “This is the legacy that Jesus leaves us,” and he wants it to be passed down through people’s loving service to others, he said. During the evening Mass at a rehabilitation facility on the outskirts of Rome, Pope Francis washed the feet of four women and eight men who are living with disabilities. Ranging in ages from 16 to 86, nine of the 12 patients were Italian, one was a Muslim from Libya, one was a woman from Ethiopia and one young man was from Cape Verde. Two sisters helped patients, all of them with limited mobility, remove their shoes and socks. The pope then knelt on both knees on a small cushion before each person. He poured water from a small silver pitcher over each person’s foot; some feet were greatly swollen due to the individual’s medical condition. With a white towel, he dried each foot and kissed it, often having to bend onto the floor to reach the feet of those who were completely paralyzed. Two aides assisted the pope in kneeling and standing back up, which proved increasingly difficult as the 77-year-old pope made his way across the chapel to serve all 12 patients. Yet, before rising, he gave each one of them a long and loving gaze and broad smile. Jesus’ gesture was like a parting gift and “an inheritance” that he left out of love, the pope said during the Holy Thursday Mass of the Lord’s Supper held at the Father Carlo Gnocchi Foundation’s Our Lady of Providence Center April 17. “You, too, must love each other, be servants in love,” he said in a brief homily, which he delivered off the cuff. The 75-year-old Muslim from Libya, identified only as Hamed, lives with severe neurological damage from a car accident. He told the Vatican newspaper, L’Osservatore Romano, that he was surprised he got an invitation. “I agreed to participate because I have great respect for Catholicism and respect for this pope, his intelligence, the way he speaks and acts. I’m a believer and I can’t create differences,” he said. The youngest patient, 16-year-old Osvaldinho from Cape Verde, was greatly moved by the way the pope looked at him, he told the newspaper. “There was something — it made me want to cry,” he said. The teenager, who is paralyzed from the neck down from a diving accident last year, said he could not believe it when he was told he was chosen to be one of the 12 people for the ritual. “I was speechless, like today. I wanted to tell him something but I was mute. I was too stunned. I will always treasure this encounter,” he said. The ceremony was held in a church on the grounds of the center; the church walls were dotted with bright stained-glass windows. A large number of patients, their relatives as well as the facility’s religious and lay staff, directors and volunteers attended the evening Mass. Medical personnel and other staff members did the readings while staff and patients, some seated in wheelchairs, provided the singing and music: One person played acoustic guitar, another marked the beat with a triangle. The pope greeted every one of the patients attending the Mass, giving them “a blessing, a caress, a comforting word,” reported the Vatican newspaper. By choosing to visit the rehabilitation center, the pope was showing the kind of “evangelical mercy that he wants to embrace the entire world of suffering,” he said. 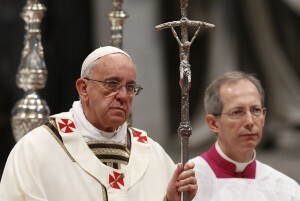 The evening Mass was the second of two Holy Thursday liturgies over which the pope presided. The first was a morning chrism Mass in St. Peter’s Basilica. As Holy Thursday and the Mass of the Lord’s Supper commemorate Jesus’ institution of the Eucharist and the priesthood, the pope continued a tradition he started last year by having lunch with a small group of priests from Diocese of Rome. The Vatican newspaper said the pope used the occasion to have the 10 priests talk to him about their ministry, especially those who were working in very difficult circumstances, and to encourage them in their mission.